After spending time out in the blustery snow building snowmen, you’ll be dying to relax in a piping hot bath. These frosty folks from LUSH Cosmetics are actually filled with two bath bombs and a festive bubble bar each. Mr. Frosty is a gifting classic from the brand. He’s comprised of 3 of the company’s bestselling bath bombs, including a fiery crackler that will spice up your bath! This year, his “better half” makes her holiday debut! 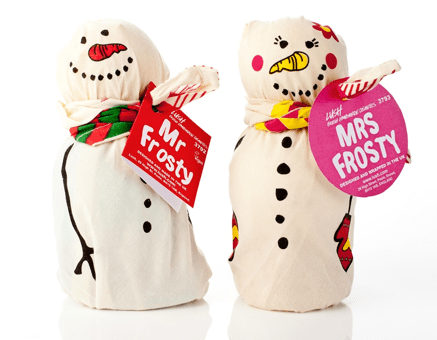 Mrs. Frosty is a gift set containing a vanilla bath bomb, apple-scented bath fizzer, and black currant “bubble bar” that turn your post-sledding bubble bath into a relaxing spa. Each adorable member of this snow family comes in a reusable knot wrap. Cutest stocking stuffers ever! The Frosty’s are a super great holiday gift pick or even better to treat yourself with. Wish I knew how to reuse the scarf after the bath products were used up. I have MR Frosty and dont know how to rewrap him.